When you have a birthday days before Christmas day it’s hard to get people together for a celebration. As a kid, my mom made sure my birthday presents were wrapped in birthday themed wrapping. Whether big or small she always ensured I had something special to unwrap on my big day. Some of my favorite themed birthday parties as a kid included a roller skating party, one at McDonald’s, and later in life a catered dinner party. 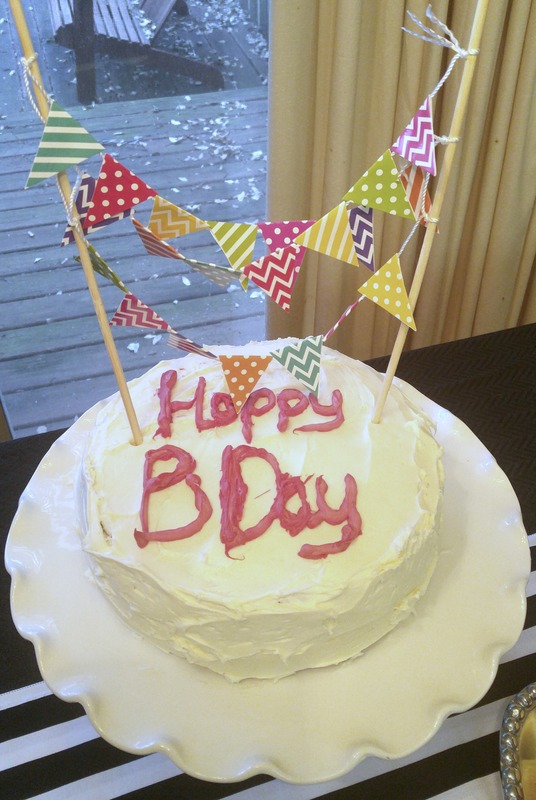 For years I carried the idea of celebrating my birthday at the halfway mark which would be in June. And well, I never acted on it. Then 2015 came and I finally sent the invitations out for a June celebration. This year I discovered my theme, where else but on Pinterest. I just love pineapples and so the theme of Party Like a Pineapple was born. I find it makes party planning so much easier when you pick out the color palette to start with and build everything else around it. I chose black and white stripes with green and yellow as accent colors. This was my invitation that was emailed. 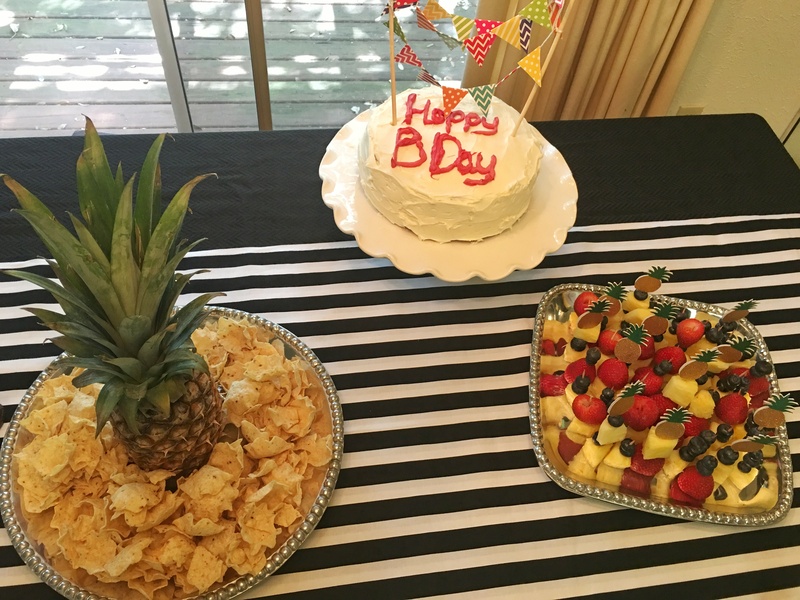 If you throw a Pineapple party you must use fresh pineapples to decorate with. With pineapples as the central theme I considered carving out the center of the pineapple to serve as a vase for fresh flowers. Great idea, but I wasn’t that ambitious! 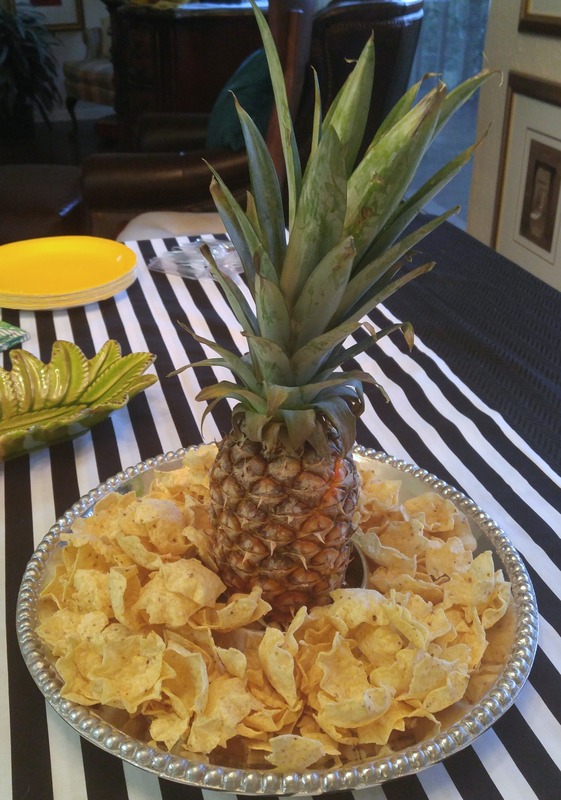 Instead I placed a fresh pineapple in the middle of my chips and dip tray where salsa would go. It worked! My TV turned DIY photo booth served as a fun backdrop to decorate. I draped a yellow tablecloth over the living room TV and hung paper mache circles, flanking the border of the display with the fresh fruit. 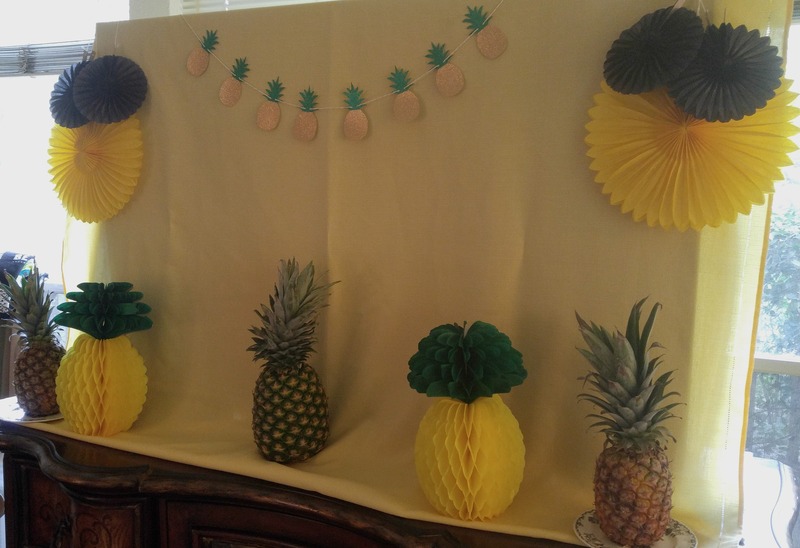 I adore this hand crafted pineapple garland I ordered on Etsy from Beautiful Paper Crafts. It came in precious packaging already assembled. 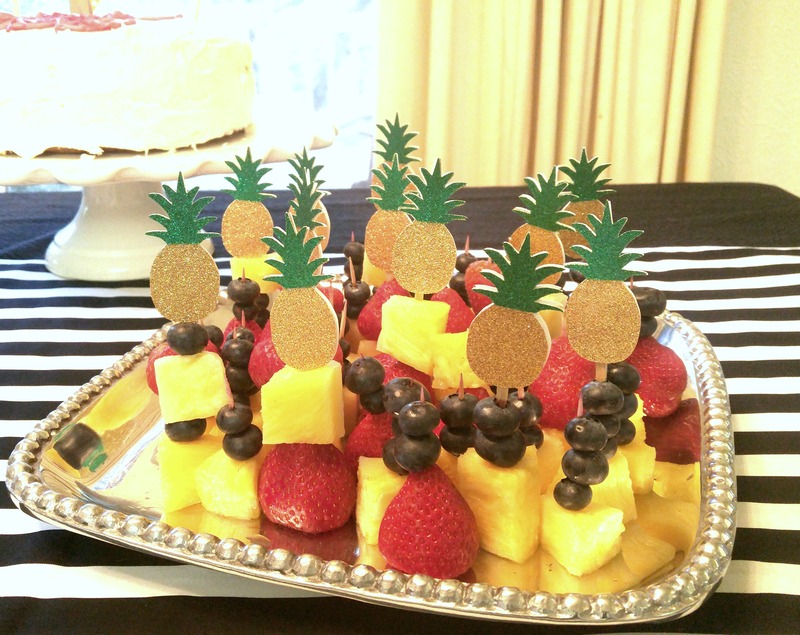 You must get the matching picks that were perfect for fruit kabobs with pineapple studded with blueberries and strawberries. They’re hand assembled and adorable. 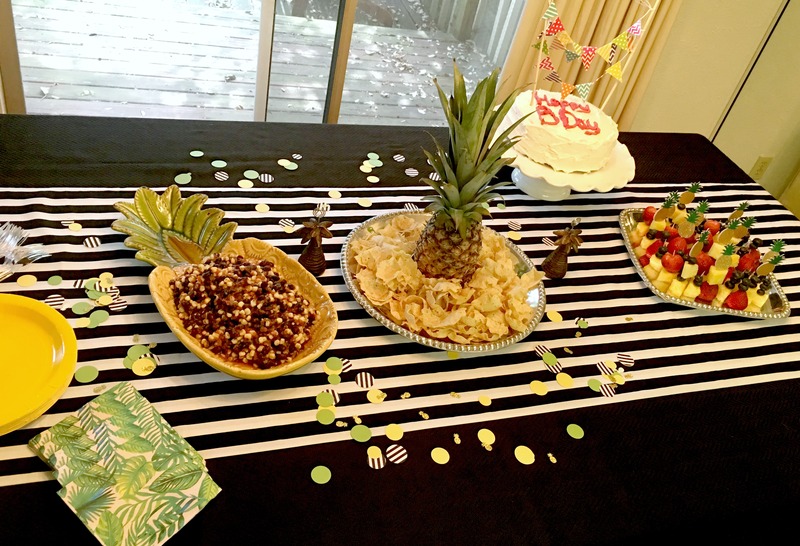 For the food table I used a solid black tablecloth creating a striped runner out of cut fabric. I’m not into sewing at all so I used double-sided fabric tape as a makeshift hem. The menu included: Ham and cheese sliders with a delicious sauce (the sauce makes these baked yummies), loaded salsa with black beans & corn (pineapple dish from Hobby Lobby), bacon wrapped pineapple, and carrot cake with pineapple. The cake topper was colorful and fun, it too came from Hobby Lobby. 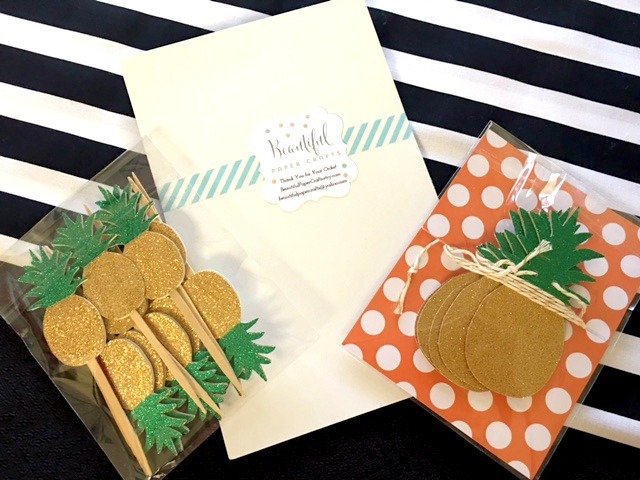 The hand cut confetti was so much fun to decorate with, it included sparkly gold glittered pineapples too, thanks to Shoplissy. The palm print napkins were a perfect accent that I found at Paper Source. No party is complete without a signature cocktail. I made Pineapple Rum Punch. 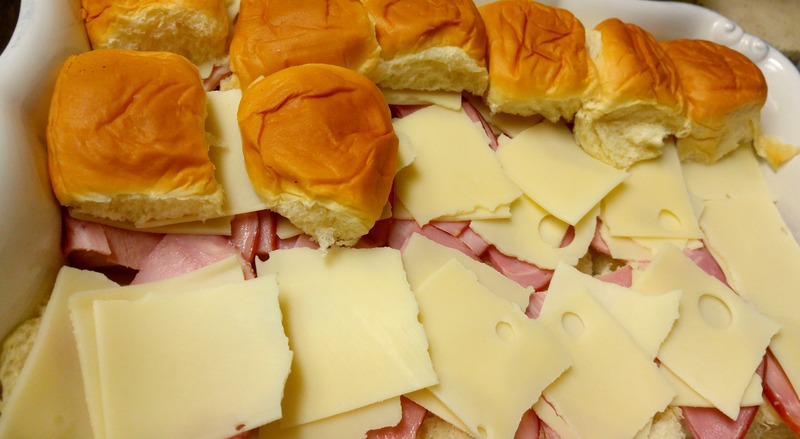 It was so easy to make and delish, perfect for any summer party! 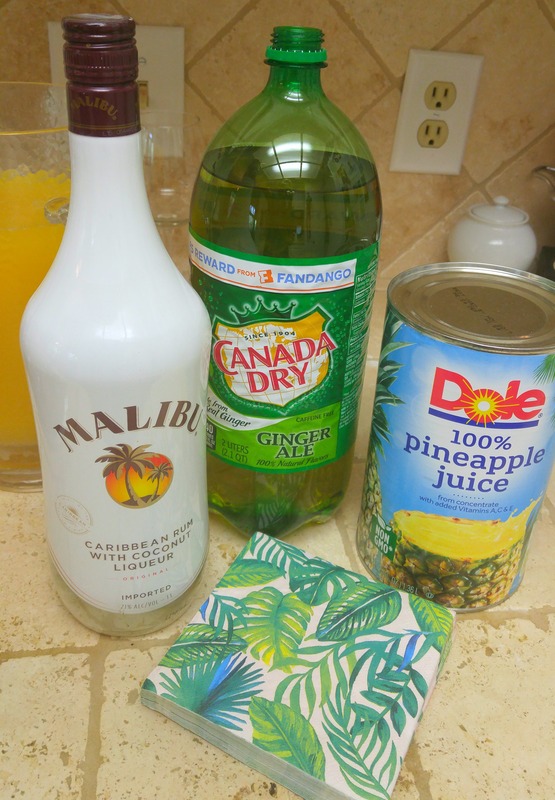 Just three ingredients Malibu Rum, Canada Dry and pineapple juice, use fresh pineapple for garnish. 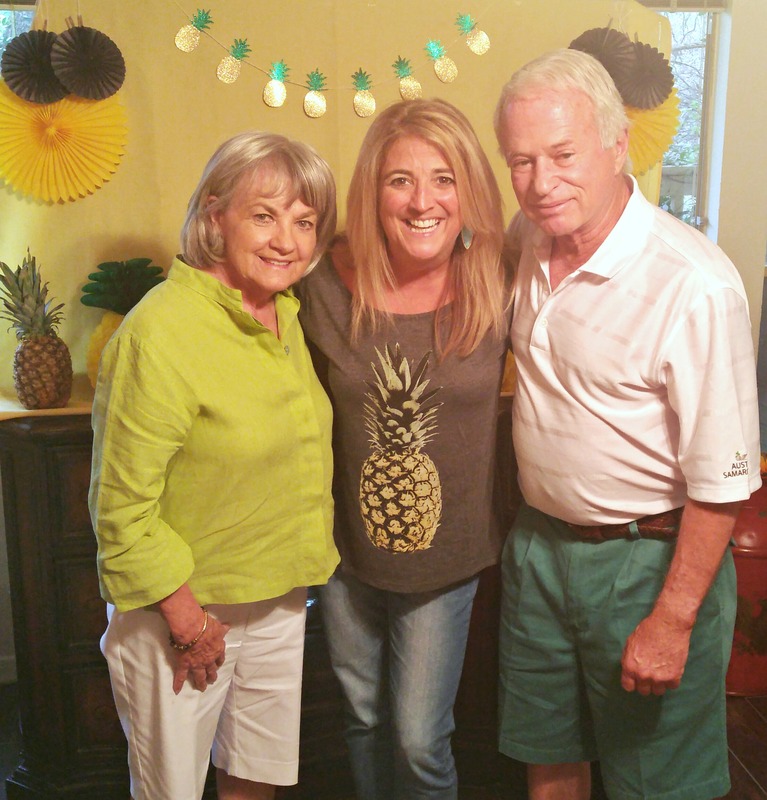 My guests were encouraged to wear pineapple print, green or yellow to got with the theme. 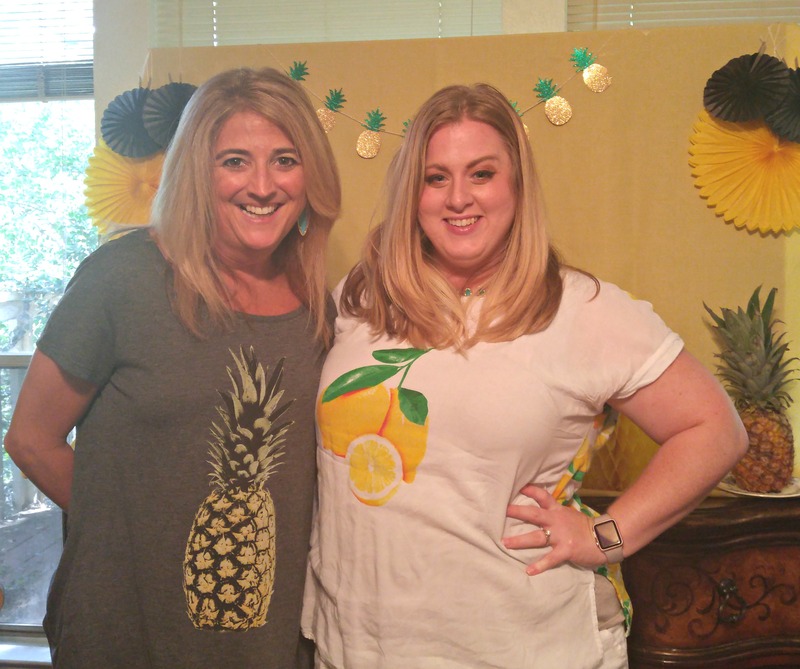 My pineapple tee came from a fun boutique that I love, Francessca’s. I made my photo booth props using colorful summer themed items (ice cream cone, sun shades, mustaches, glossy lips) printed at my local Sir Speedy shop and glued them to some craft sticks. We had a blast posing and being silly! It was a great day with some of my favorite people, and pineapples! 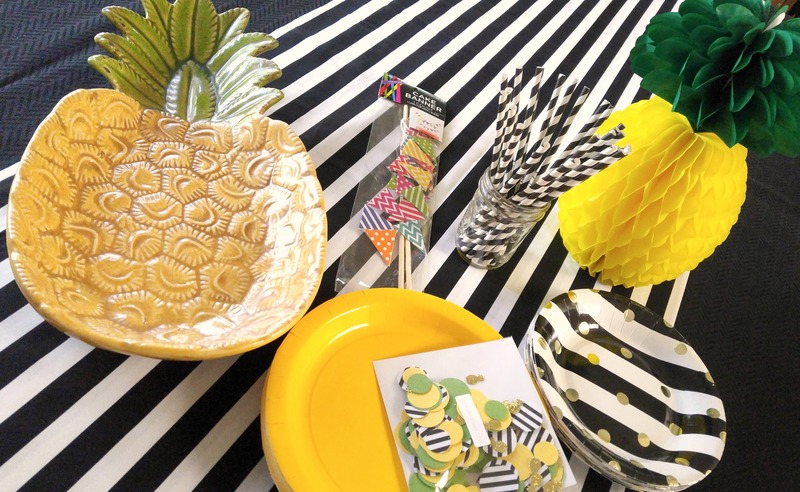 Now, it’s time to plan and party like a pineapple! 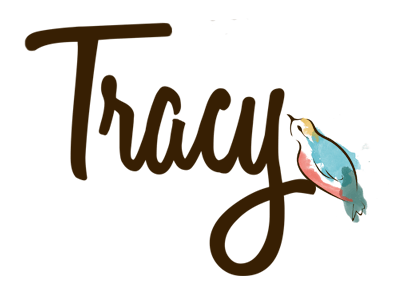 I promise you’ll love this theme party. I laaaaave this. There’s something so cute and fun about pineapples! I definitely have to do this. This is so darling! 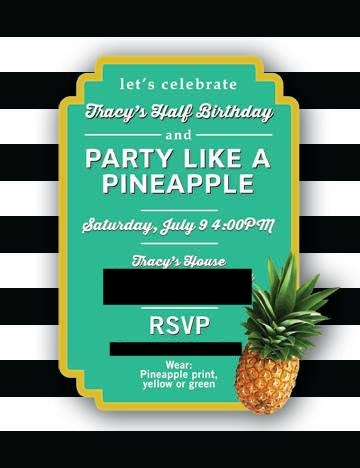 I love the ‘party like a pineapple’ invite! I Love this theme! My sister’s birthday is Christmas Eve. So this will be perfect. She is a little tired of the holiday themes. She was almost named Christy Eve. But our mother prevailed. Oh, that looks fun! I even jealous a little. Well, that wasn’t try. I jealous a lot. 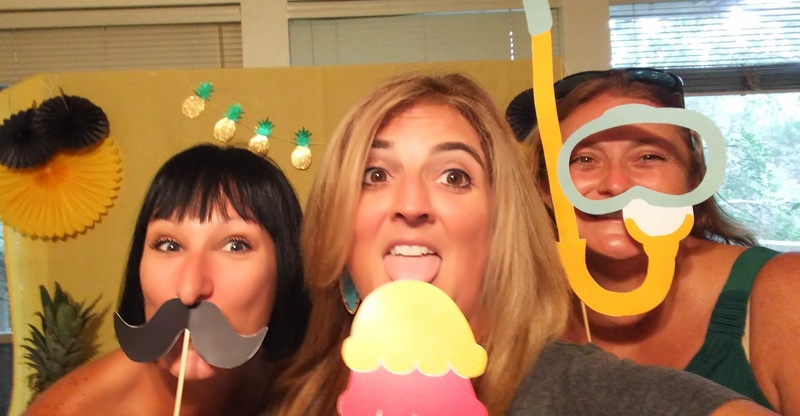 Pineapple party is such a great idea!!! Not to mention that pineapple inspired decor pieces are so trendy these days. It makes it easier to find proper party supplies!